Ahead of speaking at the upcoming Equine Clicker Conference, Helen Gilbertson interviewed Jo Hughes about what she is going to share with us at the conference. With a strong BHS back ground and an interest in Classical riding, what got you started with Clicker Training and why did you decide to take this route? Throughout my BHS training and classical tuition, I always loved that feeling of being at one with one’s horse. Those times of fluidity where all resistances between you just melted away, the horse became so balanced underneath you and you literally floated across the arena in perfect harmony together. I was always drawn to the more sensitive horses and I seemed to be able to connect with them on a level which allowed that softness and communication to develop. It was always clear that the better my feel and timing, the more balanced, soft and light I could be, the more harmonious the two of us would become. It was my current horse who encouraged me to look for more positive and effective ways to communicate with horses. I bought her as a 6 year old with plans to compete in affiliated dressage and eventing, but she had other lessons to teach me! It was as a result of my searching for deeper understandings of equine behaviour that I came across Clicker Training. I have always used food rewards within my training, but as I began to understand more about the benefits of an event marker signal (the clicker), the clarity of communication it provides the animal with and the positive way in which they learn, I became completely hooked! It is such a powerfully gentle and kind way of training animals that produces an incredible partnership based on trust and love. It also gives us the tools to be able to change our horses emotions from fear and anxiety to joy and happiness. Because it is not a horsemanship method, but instead based on scientific principles, it can be used to train our horses just about anything. My passion has always been classical riding and the gymnastic development of the horse towards lightness. Training with a clicker allows us another means of getting to that goal whilst at the same time improving our feel and timing plus it gives us means of communicating so precisely with our horses in a way that they find genuinely pleasurable and rewarding. It’s often the case that our horses lead us to Clicker Training. After discovering it where are you with your mare now? Well, I don’t want to give too much away ahead of my talk at the conference…but we have come an incredibly long way! It’s been an amazing journey and one which will inevitably continue to evolve from here as we both continue to learn and grow. She had suffered much stress and fear as a result of her previous training and so much of my training with the clicker over the years has focussed on changing those emotions for her. We now do a lot of groundwork, which we both enjoy, improving her balance through transitions and movements such as shoulder in, renvers and travers, all taught with the clicker and positive reinforcement. I am currently training her in half pass on the ground. We are also having a lot of fun riding bridle-less too, using the clicker to train subtle body posture and weight cues (aids) as our mutual communication. She certainly is a completely different horse nowadays – happy, confident, expressive, calm, responsive, soft, light, trusting and a joy to be around. Sounds like yet another fab talk, its going to be seriously hard for our delegates to chose which stream they want to be in, who do you think will benefit most from listening to you? I hope the delegates enjoy it Helen. There are some great topics being covered, I am really looking forward to it myself! It was a difficult task to pick a topic for my talk! There were so many wonderful areas I wanted to discuss so that I could share my passions with the audience. I have decided to focus on “An alternative journey to classical lightness” because I am hoping to inspire all horse owners to explore clicker training as a means of training them and their horses in classical riding & equitation. 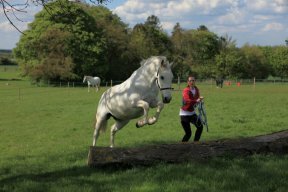 Sadly, clicker training is still often associated within the horse industry with trick training and as such many riders still take exception to the idea that clicker training really is a legitimate means of training horses for performance (whatever the discipline). In addition, many horse owners will have heard the term classical riding and/or equitation before, but how many actually know it’s true meaning, what it stands for and what separates it from any other form of riding/training out there?! As such, I have decided to take the audience on a journey through time, looking at the past, the present and into the future. In doing so, I hope to be answering some of these questions as well as uncovering some myths along the way! I guess therefore, that my talk is for everyone, no matter what their level of horsemanship or riding experience! For anyone who would love to be able to gymnastically strengthen their horses, help them to correctly balance, communicate with them via a mutually understood language not based on compulsion or coercion and ultimately to preserve and prolong their soundness. I’m sure we will all enjoy Jo’s talk as much as I enjoyed talking to Jo! I for one can’t wait to hear how she has applied the clicker to classical riding & equitation, I’m sure you can’t either.